I put this at the top of my list because I’m crazy about our dogs, cats and bird. 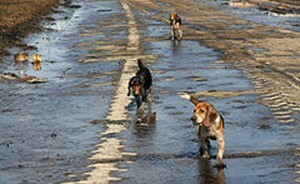 There were so many unnecessary tragedies that involved beloved pets in the aftermath of Hurricane Katrina, and after watching that unfold, I determined that I would never leave ours behind. Pack my Grab-and-Go Binder containing copies of vital financial and family documents and my Survival Mom Binder with printed information helpful in emergencies, such as maps and water purification instructions. This could all be part of your G.O.O.D Survival Manual (Get Out Of Dodge). When the 8th largest economy in the world is on the brink of collapsing, it’s bound to have a ripple effect throughout the rest of the world. In less than six months, Russians have lost half their wealth as the result of a fast moving collapse of their economy. So far this year, the Russian ruble has dropped nearly 50 percent against the U.S. dollar. In recent days that collapse has accelerated at rate that has caused many to pull their money out of Russian banks, signaling a possible run on the banks. The trouble is only being exacerbated by a global drop in oil prices, which is hitting Russia especially hard because as much as half of the governments revenue comes from oil and gas exports. It’s no secret that our interconnected world has linked all of our economies together. When the 8th largest economy in the world is on the brink of collapsing, it’s bound to have a ripple effect throughout the rest of the world. Add in the fact that the U.S. economy is probably in even worse shape than Russia, we’re just a little better at keeping our Ponzi scheme running, and we have the perfect recipe for disaster. Yesterday we highlighted some of this country’s most recent economic numbers, as reported by the Census Bureau. What we found was more than a little bit troubling. According to the latest census numbers, one in five U.S. millennials – adults 18 to 34 years old – now live in poverty. Almost two-thirds (65 percent) of children in the U.S. now live in a home that receives assistance from at least one government welfare program. Although the government claims a 6.1% unemployment rate, a record 92,447,000 in the United States are not working. If you look at the actual number of people without jobs, it’s not hard to realize the government unemployment numbers are a complete sham. We are now over 18 Trillion dollars in debt – a number that doesn’t even account for the $222 trillion in unfunded liabilities this government owes. In 2013, the latest numbers that have been released by the government, 20 percent of U.S. families lived in a household where not a single person had a job. If that’s what our federal government considers a robust recovering economy, then Houston, we have problem. 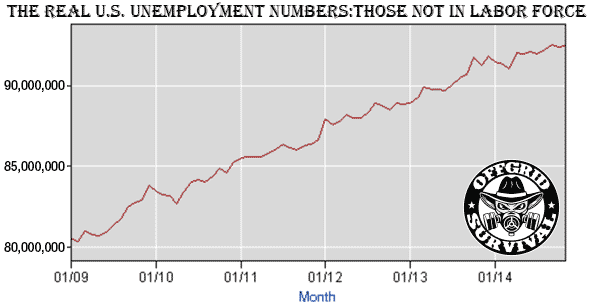 Since President Obama took office in January of 2009, the supposed beginning of his robust economic recovery, over 12 million people have stopped looking for works and joined the ranks of the long-term unemployed – a number that the government conveniently leaves out of the official unemployment numbers. In that same period, over 14 million extra people started receiving federal food stamps. When Obama took office in Jan. 2009, 31.9 million people received food stamp benefits. As of Sept. 2014 (the latest available data reported by the Department of Agriculture), 46,459,998 people in the U.S. received food stamps. What can you do to prepare for the coming trouble? Start an Emergency Fund & Get out of Debt : Starting an emergency fund is one of the best things you can do to protect yourself and your family from not only large-scale disasters, but those events in life that can feel like the end of the world when you’re in the middle of the situation. During any type of economic collapse, those in debt, and those without savings are going to immediately feel the pain. While I often here the argument that debt won’t matter once the economy collapses, let me remind you that during the 2008 economic meltdown, millions of people lost their homes, lost their jobs, and were unable to pay for even basic necessities because they lacked adequate savings to see them through the disaster. Do you really want to lose your home to debt collectors before the collapse even happens? Invest in Long-term Consumables: Start stocking up on things that you know you’ll need and use in the future. 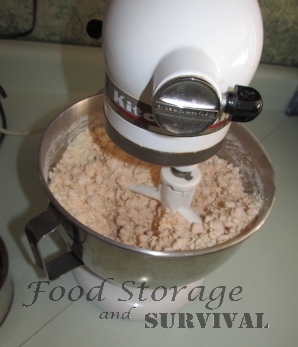 Emergency supplies, firearms and ammo, long-term food storage, and everyday household goods are all things that you’ll need, and will continue to hold their value after the collapse. Take a serious look at your Defense: If the collapse happens, one of the biggest threats you’re going to face is from people looking to take advantage of the situation. The chaos we’ve witnessed over the last couple of months will pale in comparison to what we’ll see during a full-scale economic collapse. Start looking into ways to secure and fortify your home. Learn the basics of self-defense, and consider learning how to use a firearm. Watch for signs of social unrest, and stay alert to what’s going on around you and in your neighborhood. Invest in a Bugout Bag, and have an evacuation plan: Having an emergency evacuation plan is an important part of being prepared for any type of disaster. If things start going really bad, there may be a need to temporarily evacuate your immediate area. In cases where evacuation becomes necessary, you need to have a bag full of emergency supplies that are ready to go at a moment’s notice. Given the popularity of prepping today, it stands to reason that many companies would jump on the bandwagon and try to cater to that market. You can now find pre-made survival kits at places like outdoor stores like REI and even at discount retailers like Walmart. But is buying a pre-made kit a good idea? Well, like anything else in life, it depends. The first problem I’ve seen with many commercial kits is that some or all of the components are of poor quality. If you are staking your life on an item, you want it to be up to the task. Some kits are nothing more than cheap, dollar store quality items tossed into a sub-average knapsack. You really aren’t saving much money with those kits. Sure, the package says the kit contains 200+ survival items. 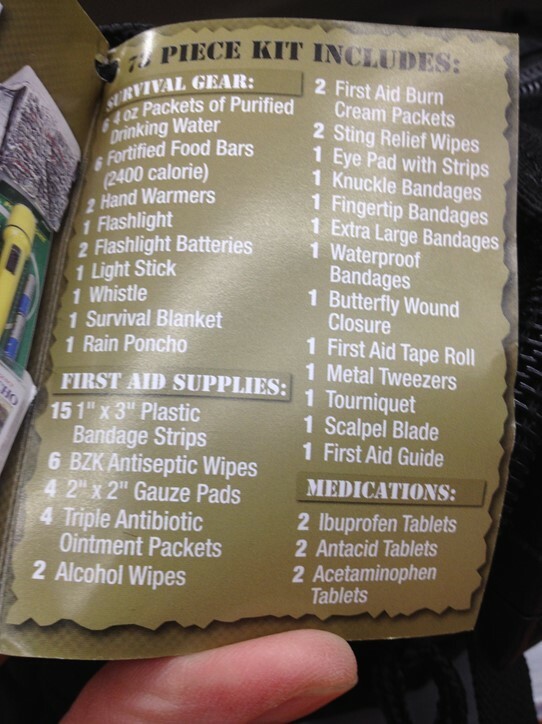 But, they also count each adhesive bandage as a single item. A third issue with many pre-made kits is the container they use, such as the backpack or duffel bag. 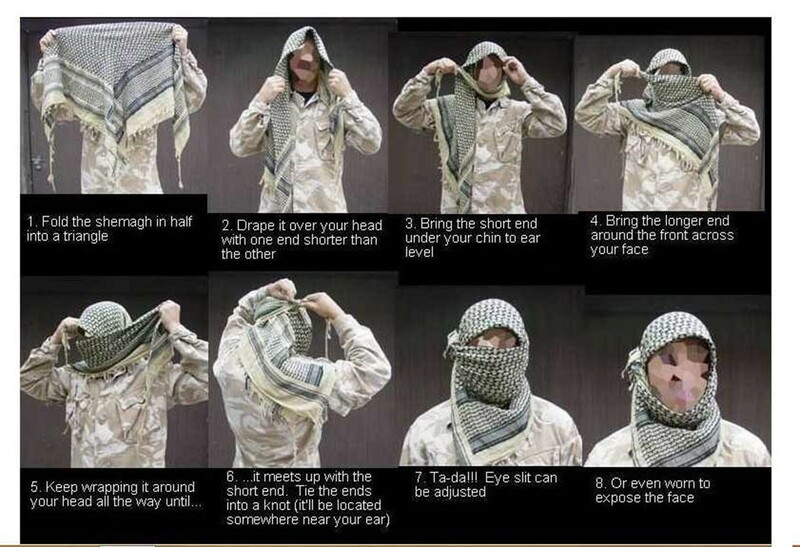 Typically, these are cheaply made and aren’t going to hold up in any sort of realistic survival scenario. If you’re hoofing it to your bug out location, you don’t want to discover a hole in the backpack halfway through your journey, a hole through which much of your gear has managed to leak out from over the last several miles. In most cases, you are far better off assembling your own kit from the bottom up, taking into account your own skill sets, your needs, and your overall situation. What works for one person might not be the best idea for another. However, commercial kits can serve as a starting point. If you purchase a kit with that in mind and take the time to become familiar with each provided item, you’ll be in a far better position to decide what else needs added to the kit. 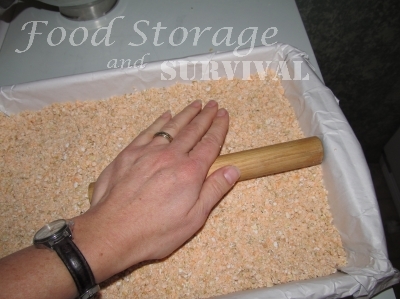 Personally, I like the products sold by Echo Sigma as well as those made by Survival Resources. Both companies take great care in selecting gear that actually works under real life conditions. Of course, the kits they assemble and sell aren’t cheap, but neither is your life. Of course you can go back through this blog to older articles and find many ideas for making your own kit. The best thing to remember is either buy or make your own, but “HAVE ONE“. 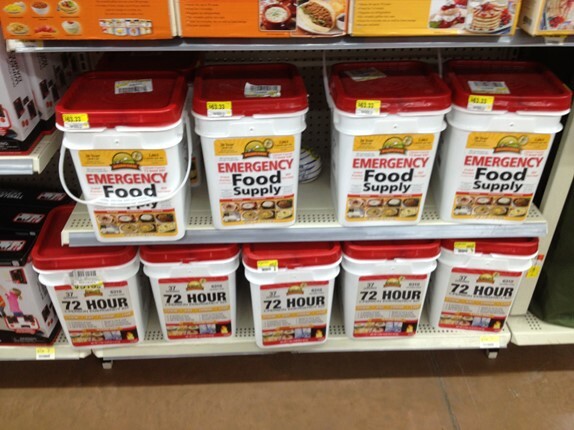 On bottom where emergency food storage and 72 hour kits. Not too bad for Walmart. As with any “prepping shopping list” you’ll need to tailor the suggestions listed below to meet your specific needs, skills, location and circumstances – no such shopping list can cover the needs of everyone in every situation, everywhere. The items listed below make up what is commonly referred to as a basic 72 hour kit and is where you should start your preps. In the following days, we’ll build and expand your stockpile to the point where you will be prepared for both short-term and disasters lasting six months or more. Now let’s head to your local shopping mall or department store. A three-day supply of water – one gallon of water per person, per day. A three-day supply of non-perishable food – foods ready to eat or requiring minimal water are preferred. Small portable, battery-powered AM/FM radio extra batteries. Extra clothing according to climate and season. Kitchen accessories and cooking utensils, styrofoam plates and bowls and a manual can opener. Special needs items, such as prescription medications, eye glasses, contact lens, and hearing aid batteries etc. Sleeping bag or warm blanket (one per person) rating depending on location and climate. A multi-tool. A roll of duct tape, crowbar, hammer, staple gun, adjustable wrench and Bungee cords and heavy duty work gloves are also nice to have, but add extra weight. Small bottle of unscented liquid household bleach and an eyedropper for water purification. Plastic sheeting, duct tape and utility knife for covering broken windows or sheltering in place. Large heavy duty plastic bags and a plastic bucket for waste and sanitation or other suitable solution. A small multi-fuel backpackers stove (Colman makes a quality product). N95 Respirator for each person in your group (2 or more). It’s also a good idea to have photocopies of credit and identification cards, health insurance and other important documents in a water proof container and $100 in emergency cash in small denominations. Also don’t forget photos of family members and pets for re-identification purposes if you get separated. You’ll also need to put together a list of emergency and personal contact phone numbers as well as a complete list of allergies to any drug (especially antibiotics) or food for each person. It’s also a good idea to have an extra set of keys to your house and vehicle. Remember, the 72 hour kit may also serve as an evacuation kit so it all needs to be stored in easy to move containers. You want to be able to “grab and go” should you be forced to evacuate your home. 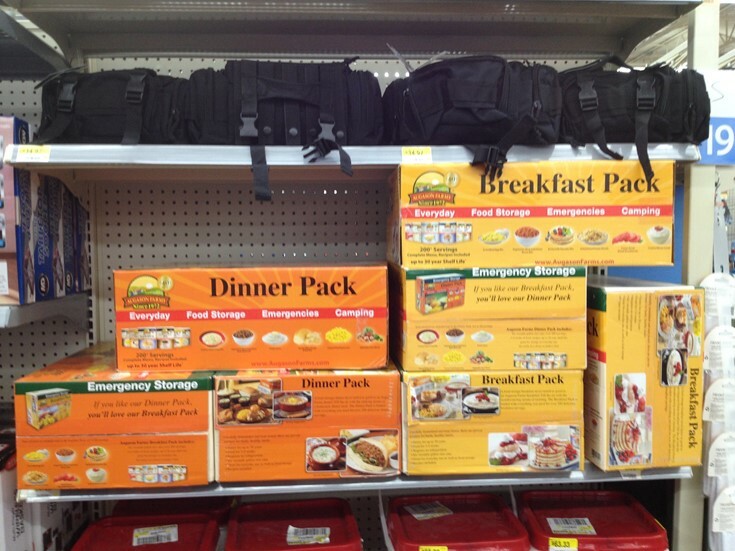 I prefer to “double pack” – first neatly pack everything in duffel bags or backpacks the store these in plastic totes making it easy to quickly load everything into your car while still having the option of slitting up the gear among your group if you’re forced to evacuate on foot. …but you can’t get there! Look, even the best plans can and do go wrong. … maybe there’s a natural disaster between you and it. You KNOW it isn’t enough just to flee with your loved ones without having a location to go to, right? But where do you go if your bug-out plan has been trashed before it could even begin? You need a “Plan B” destination. One place you might not have considered: CAMPGROUNDS! Campgrounds are often in secluded locations off the beaten path. Others fleeing will jam themselves into hotels and FEMA stations and won’t think about campgrounds. Most people will be looking for more built-up areas with obvious supplies to loot. People don’t typically think about “looting tents” so campgrounds will help you avoid these areas where you may encounter hostiles. Within that circle, look for campgrounds that are remote enough, but which have water and toilet utilities and are near secondary water sources like streams. You want to be 15 to 20 miles from a town so you can walk in and resupply, but you aren’t too close. Map out 3-4 options in opposite directions from you. This gives you the ability to travel in any direction that poses the least threat to you and your family when a crisis hits. A campground on elevated terrain is your best option. It’s safer from flooding, gives you a better view of your surroundings, and discourages a lot of people who won’t want to hike up-hill to get to you. 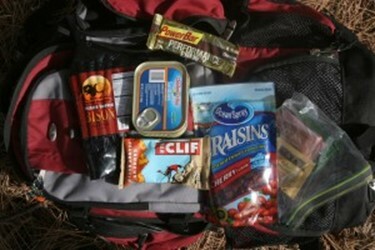 If you need to bug-out, think “ultralight” with your survival gear. 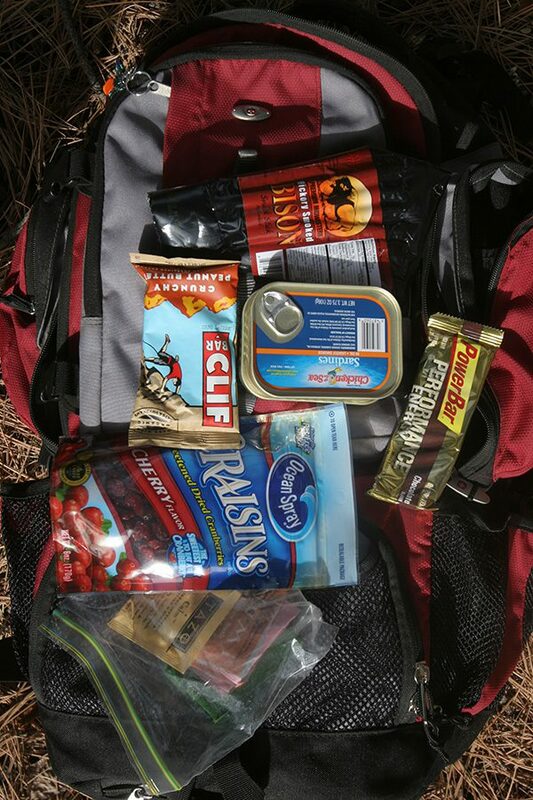 This is the approach used in the light infantry long-range recon (LRRPs) to travel fast and yet have all the gear needed to sustain yourself for long periods of time on your own and without resupply. In the military, my squad always had a “plan b” for every attack because we never knew if there were going to be new obstacles in the mission or how the enemy would react upon contact. Well, you never know what Mother Nature has in store for you either, so break out your map and look for your “Plan B” bug-out destination now. 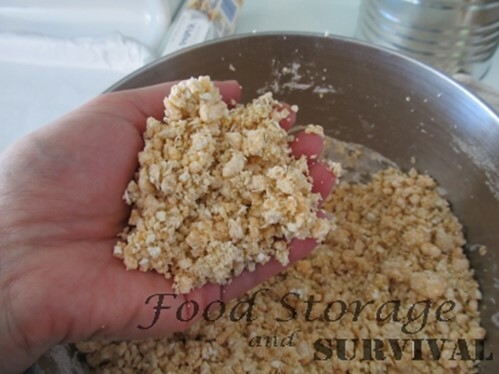 Have you ever wanted to make your own survival food bars? 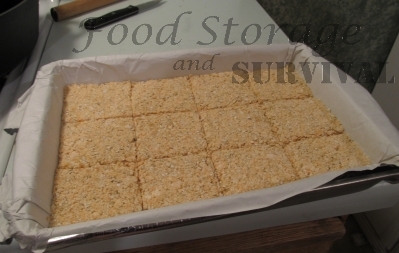 Like the survival food bars the stores sell, but homemade survival bars so you know what’s in them. Apparently there are a couple of different recipes out there for these survival bars, so maybe try them all. With approximately 2000 calories total, low cost, and long shelf life, these are a fantastic addition to your vehicle emergency kit or 72 hour kit. But there were some problems. Holy cow, they were hard to mix. Then they overcooked a bit and stuck to the pan. And finally, how in the world are you supposed to eat that brick? There were lots of suggestions in the comments to alleviate some of these problems, so I did some testing and today I’m sharing the results so you can make your own homemade survival bars even better! Instead of using your tortilla roller, you can place a sheet of parchment on top of the dough and compress it with another 13 x 9 pan pressed down firmly on top of the dough. For long term packing, I’d seal them in Mylar with an oxygen absorber. They may be hard enough to poke holes in a regular vacuum sealer bag, but Mylar 5 mil or thicker should hold them fine. 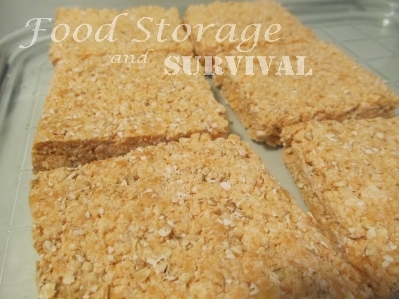 Approximately 2000 calories per batch, (around 225 per small bar) easy to make, and now easier to eat, these bars are perfect for your emergency kits! Food is the fuel your body burns to keep you warm and provide energy. It’s like putting gas in your car: Without fuel, you won’t be able to go far. When your energy “tank” runs dry during an emergency, you will feel weak, cold and not have enough energy to save yourself. 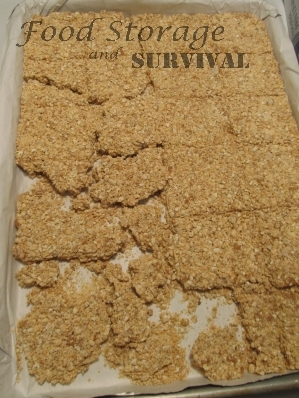 Food, like your survival knife, is one of the Ten Essentials, and should be included, in some form, in your survival kit. your urban or wilderness survival gear. Earthquakes cause widespread damage, and survivors will need energy. As a pillow – Wad it into a ball or even stuff it with leaves or grass. It makes a good substitute pillow whether you’re in a survival situation or a long car or bus ride. As a fashion accessory – Wear it around your neck without covering your head. It is, after all, a scarf, and it comes in several different fashion friendly colors! 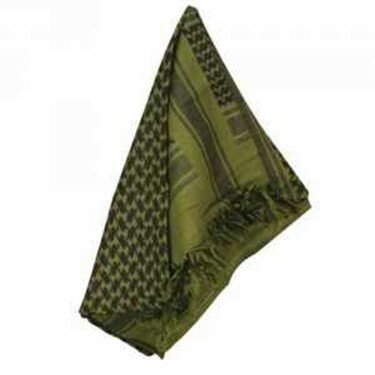 You can buy shemaghs on Amazon as well as other online sites. The 10 C’s of An Emergency Kit – Do They Work? Awhile back I decided the pack I carried around was getting too heavy. I kept adding gear to the pack because there was space in it and pretty soon I was packing stuff in sideways and stuffing it in as tight as I could get it. The thing is when I went out in the woods with what I had I wasn’t using half of it. I wrote a post about using a smaller kit here. So the question is: does it work? I’ve had a chance to evaluate it for a month or more now and I’m pleased to report that I like the new configuration much better. First of all it’s light. 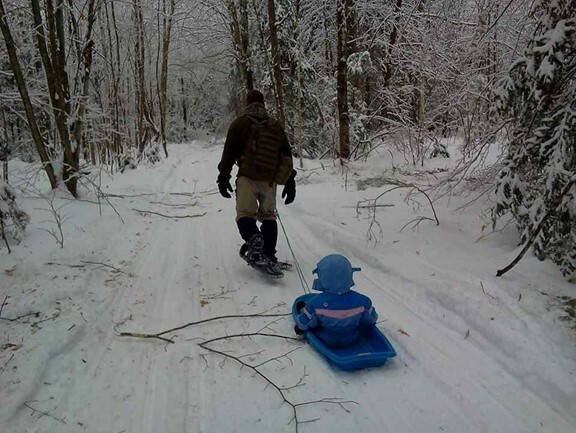 On Christmas day I strapped myself to a sled with my boy riding on it and then put my pack on over the straps. Then I hauled the whole mess out into the woods to make some noodle soup for me and my son. Even carrying the pack and pulling the sled it was much easier than carrying my old pack. There’s also much more room in the pack for extra gear *if* I need to throw something in. This also makes it much easier to find gear in the dark if needed. I’ve added a few extra things that aren’t in the original 10 C’s, but I’ve done it with the idea that it has to be extremely important to me in order to earn a spot in the bag. In short, this is a much better kit for me in the woods than what I was carrying. That’s not to say if I was going on a longer camping trip I wouldn’t pack a heavier bag, but for tooling around in the woods for a day I can’t beat it. It’s got everything I need to survive if I get stuck out there over night and it’s light enough to carry around, even in the deep snow, without killing myself. Keep in mind this list might look different for you. The most important tool in your wilderness arsenal is your knowledge and experience in the great out doors. You might be more comfortable with different items than what I have here, so when choosing gear for your list make sure you take that into account. Like I said earlier, I added a few items to this list that probably aren’t covered in the 10 C’s like a first aid kit and a plastic cup in addition to my steel cup. The reason for that is that I like to have a hot drink while I’m eating out of the canteen cup. This is purely a personal decision based on how I like to do things when I’m out there. Could I live without the extra cup? Certainly, but it’s worth it to me to carry that extra item. The first aid kit was added because I cut myself a couple of times with that new sharp knife. Totally my fault, but when I say that baby is sharp you can believe me. After the second time I cut myself and used toilet paper and duct tape to bandage it up I figured I’d add a simple first aid kit to the pack. It weighs next to nothing yet has enough bandages to stop the bleeding if I ever give myself a serious cut. In short, the 10 C’s have everything you need to survive and if you add just a few small extras you can be comfortable as well. When you’re out in the woods even the smallest item can be considered a luxury. Be sure not to start adding stuff back in thought or pretty soon you’ll be right back where you started. I love popcorn tins! I love all the different ways they come decorated – the wonderful Christmas themes, the various John Deere Tractor motifs, professional sports team logos, stock car racing favorite drivers and their race cars, the endless and delightful cartoon characters – just to name a few. They are like time capsules in that their outside decoration reflect what’s popular in the culture during any given year. When they are displayed on a shelf, looking at them is like going back in time. I can’t get enough of them! Not only are they decorative, but popcorn tins are versatile. They are the perfect size for storing many prepping items and because they are metal, are especially good for keeping long term food storage safe and secure. Apart from being the ideal size for systematic shelving, they keep out bugs and other vermin. Mice can’t chew through steel. The lids on these tins are typically very tight, which also make them ideal Faraday cages. Just line the inside with cardboard (including the lid) and put in the electronics you wish to protect from EMP. I have stored a variety of items in Christmas popcorn tins but none more important than my long term food storage. Each of my tins hold a week’s worth of food for 3 adults, including coffee, tea, spices, serving plates, cups, utensils, and matches. When I get a shiny new popcorn tin, after sharing and enjoying all the delicious popcorn inside, I turn it into a self-contained no-brainer grab-‘n-go little bundle of lovely life-sustaining survival! There are 3 adults in my immediate household, so I prep for 3. My goal is to pack one week’s worth of nutrition in every tin PLUS all the items necessary to consume the food, conserve water, and make life easier during what will no doubt be stressful times. When my tins are packed and shelved, I can see at a glance how many weeks and months of food I have on hand, and it makes rotating the perishables from each tin very easy. 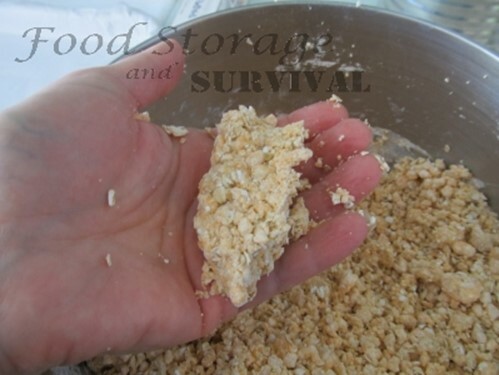 Of all the foods in a long term food storage plan, no better food items have been found to be the overall best for sustaining life than beans and rice. Cheap to buy and easy to store, when rice and beans are cooked and combined they are the supreme complimentary nutritional food creation which gives a human being a near-daily requirement of usable protein, essential vitamins and minerals. When one adds additional protein, spices, and vegetables – it becomes almost a perfect meal. So the core components of my popcorn tin are 20 pounds of white rice and 10 pounds of beans. 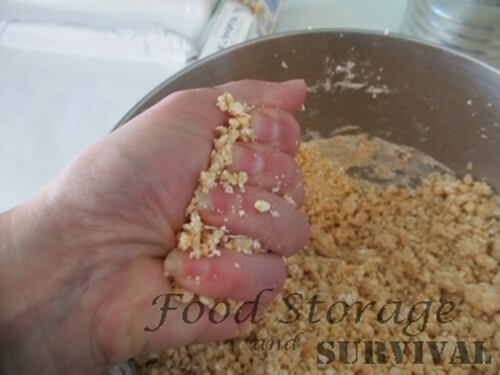 A serving of rice has long been held to be “a handful” or ½ cup. 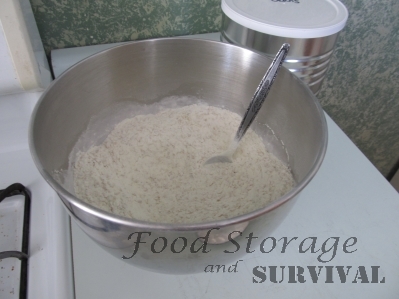 When cooked, white rice will expand to be twice it’s size, so ½ cup of dry rice expands to be one cup of cooked rice. 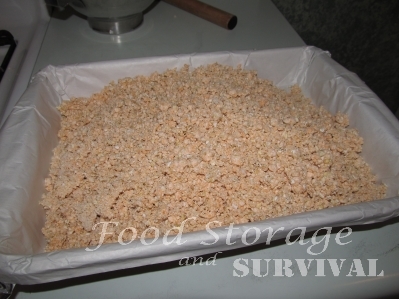 In a 20 pound bag of uncooked rice, there are 20.154 cups or 40.3 ½ cups. If using long grain white rice, there will be about 200 calories in a ½ cup dry/1cup cooked serving. Nutritionally I plan on serving one cup dry/2 cups cooked serving of rice per adult per day, which translates into about 400 calories per day per adult from rice alone. So a 20 pound bag of rice = just under 2 cups of cooked rice per day per adult for one week. Now lets look at beans. My household ‘s favorite beans with rice are black beans, so I heavily favor black beans. I round out my bean varieties with pintos, great northern and red beans as well. Personally, I think black beans are the easiest to cook, even under primitive conditions. And they take seasonings well, giving you a nice variety of tastes. Nutritionally speaking, black beans are among the powerhouses of the legume family. So long as you don’t skew the proper ratio of rice to beans and serve too much rice and not enough beans. When beans and rice are combined they form the almost perfect useable protein. Individually, rice and beans are incomplete proteins. Together, they complement each other and create a complete protein. As such, they are a good replacement for meat at some meals. Rice and beans also contain vitamins, minerals and fiber. What is the perfect ratio of rice and beans? I prefer 2:1 with beans being 2. If I cook 3 cups of rice for one meal for 3 adults, then I prepare 6 cups of beans. That might seem like an awful lot of beans, but keep in mind that if eating beans and rice alone with no meat, then you need more beans to get enough protein. 1 cup of cooked black beans = about 15 grams of protein. One meal of beans using my portion sizes gives each adult 30 grams of protein. (Recommended daily = 46/60 female/male). With the protein from the additional meat, not to mention the protein in our other snacks and milk drinks, we meet and/or exceed daily protein needs. So, o ne pound dry beans = six cups cooked beans, drained. One pound dry beans = two cups dry beans. There’s the 2:1 ratio. 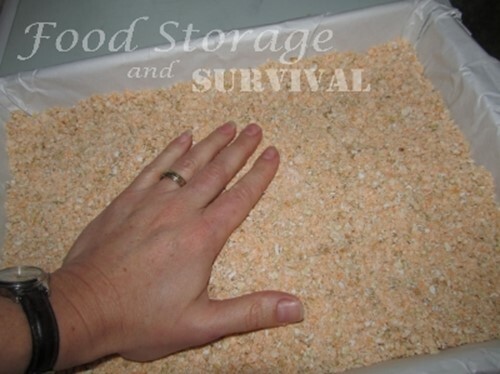 By storing a 10-pound bag of beans in the one-week food tin, we would have enough to even feed a guest. I use different beans, (principally pinto, great northern, and red beans) for each tin to keep some variety and to avoid ‘food fatigue.’ But it’s the addition of different kinds of vegetables and seasonings that truly help to combat food boredom and increase nutrition. But I don’t stop there. At the bottom of my tin, I place 6-7 cans of vegetables that my household personally enjoy with rice and beans, which complement the meal and enhance the flavor. 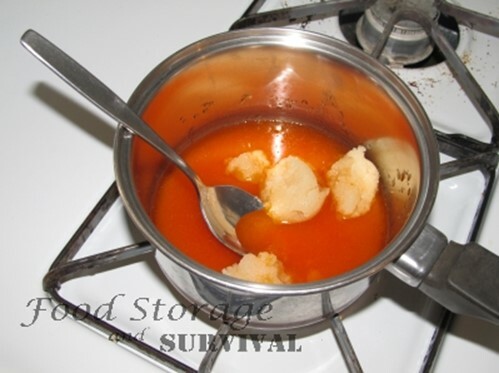 Canned goods such as stewed or diced tomatoes, mixed vegetables, and even whole kernel corn. For additional flavoring I pack salt, pepper, packets of bean and rice flavorings, dry soup mixes, bullion cubes, as well as straight spices individually stored. 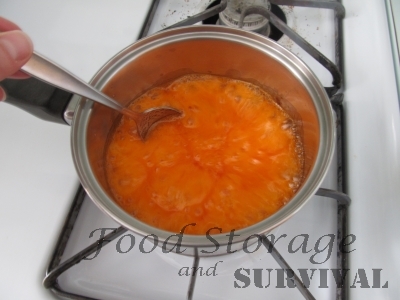 To save space or add more food, you can store cans of tomato paste. On top of those canned vegetables I put in a small canned ham, 2-3 cans of white meat chicken and a can of vegan cutlets. 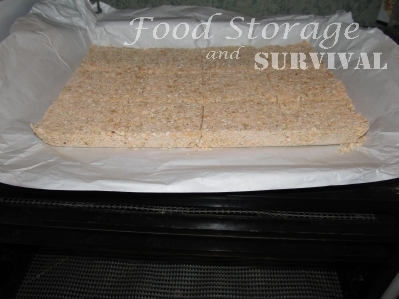 Next I pack enough paper plates and plastic utensils for a weeks worth of meals. Having these will save water from having to be used to clean too many dishes. On top of that I pack 10 pounds of beans, and 20 pounds of rice, each in their own mylar bag with oxygen absorbers and sealed. Tucked down in the crevices are my seasonings, spices, breakfast bars, snack jerky, peanuts, trail mix, dried fruit/fruit leathers, tea bags, individual coffee packets, dry coffee creamer, packet sugar, powdered milk, hard candy and daily vitamins, all also sealed in mylar and labeled. 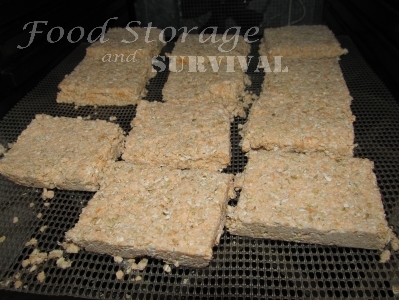 Before closing the lid, I place a few large Ziploc bags on top and tape a bundle of waterproof matches to the underside of the lid. A week’s worth of breakfast, lunch snacks and one main meal for each day. Calories per day vary between 1800 – 2200 for each adult. Daily minimum protein requirements covered and/or exceeded. I mark the date packed on the bottom of the tin and under the lid because I don’t want to mar the lovely decoration on the outside. Tins are stored on a shelf and rotated through by date. When we empty one tin, I know it’s time to put together another one. In a separate food grade bucket I have my cooking tools: small portable propane stove with fuel canisters, a volcano stove (for boiling water), Esbit stove, fuel cubes, a thermos bottle, a collapsible water carryall, water purification tablets, large spoons, wooden spatulas, cook pot, small skillet, fire starter, dish cloths, ditty bag for cleaning kitchen prep tools Girl Scout-style, plus additional snacks and spices. The various means to boil water and cook the rice and beans also include over an open fire, hence the fire starters, and waterproof matches. The thermos bottle is for more individual cooking of the rice and beans and for storing food to stay warm. One never knows what circumstances you’ll encounter in a bug out situation and separation may happen or be prudently required, hence the various means to accomplish the same task. 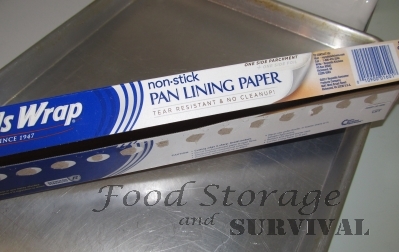 My other non-food preps are generally stored in large cargo container-type boxes, but my bug out grab-‘n-go items are in #5 food grade buckets with labels detailing what’s inside. We have fit everything we need to bug out with in six buckets and will grab-‘n-go with as many of my survival food packed popcorn tins that we can fit in the bug out vehicle. Each one of the popcorn tins represents a week’s worth of food for three adults. We will know exactly how much food we have and how long it will last. If rice and beans are not your favorite foods, then consider packing a popcorn tin with foods that will meet or exceed all nutritional needs, combat food boredom, provide for caffeine intake, snacks, and spices. The challenge is to fit enough food in the tin that will meet all nutritional needs 2-4 people. Can you do it? Unless and until we may need to grab-‘n-go with our popcorn tins filled with our survival food, it’s comforting to see them all lined up on the shelf. They represent our will to survive and thrive, and they look pretty, too! 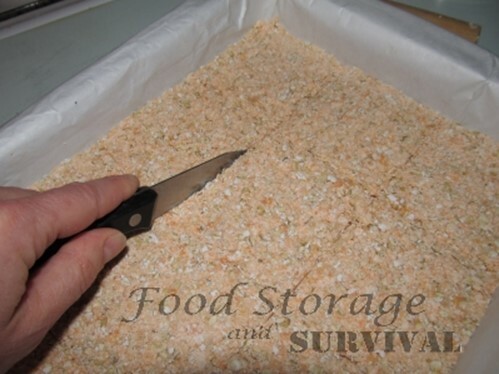 In addition to their usefulness for food storage, steel popcorn tins also make great Faraday Cage containers to protect small electronics from the effects of solar flares and electromagnetic pulse (EMP.) No modification of a tin is required, and grounding a Faraday container is actually counterproductive. 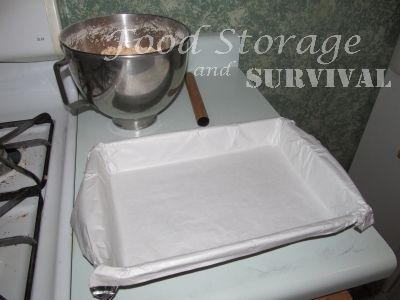 Just wrap your electronics in plastic bags, place them in a steel popcorn container and push the steel lid down firmly. If you live in a humid climate, be sure to toss in a bag of silica gel desiccant, for good measure.